It’s an inevitable fact. We’re all growing older every day. With age and body changes, medical issues tend to erupt, and dental care becomes even more important. At my dental office in Long Grove, we’d like to explain why regular visits for seniors is so crucial for a healthy body. The mouth is the window to the rest of the body, and a lot of oral health problems are linked to problems elsewhere in the body. This makes it incredibly important to let your dentist in Long Grove know if you have certain health conditions that can affect your oral health. Some of these diseases include diabetes, cancer, and heart disease. When your dentist knows what’s going on in the rest of your body, they’re able to treat you properly. However, just like whole-body conditions can impact your oral health, your oral health can impact the rest of your body. Gum disease is incredibly prevalent among the older population. In fact by age 65, 1 out of 4 has gum disease. Additionally, the American Academy of Periodontology estimates 20-30 percent of adults have gum disease severe enough to put them at great risk for tooth loss. Gum disease not only increases the chance of losing natural teeth, it greatly affects the rest of your body. Speaking of medications, they can work wonders in easing pain or treating chronic problems. However, they can also lead to a very dry mouth. Dry mouth is a big concern in keeping a mouth healthy. Without saliva, teeth are at increased risk for decay, oral infections can develop, and could lead to gum disease. 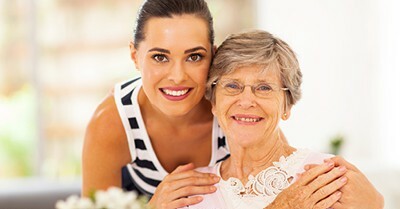 Grandparents, parents, and any elderly person should be seeing a dentist regularly to ensure optimal health. If it’s been awhile since the last dental visit, give my Long Grove dental office a call. Accepting patients from Long Grove, Lake Zurich, Buffalo Grove, and nearby neighborhoods.